Jan De Graaff c. 1958. Recorded as being selections from 'Golden Clarion'. We received at B & D Lilies a �clone� of Copper King (inset photo) from the late Ed McRae that was known as OG-46 and reported by Ed as being the seed parent for the Copper King strain. As was with M-12 Black Dragon, pollen was taken from the best seedlings each year and put back on �mom� for the next years seed production. Also, as with M-12, this seed producing clone no longer exists making this strain impossible to re-produce. 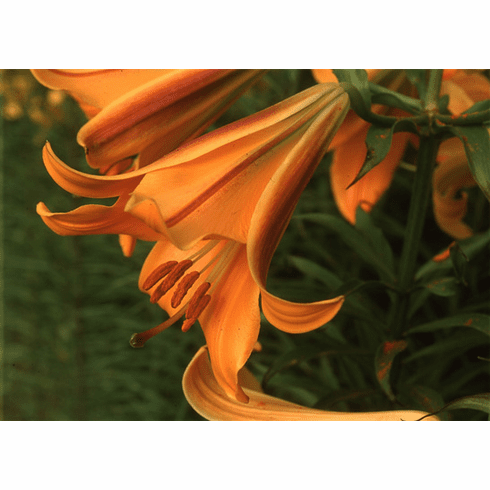 Photos, B & D Lilies.